Kristen Roman, a City of Madison Police Department captain with extensive experience in community outreach, mental health issues, and services to vulnerable populations, has been named University of Wisconsin-Madison chief of police. Roman will begin her duties on campus Jan. 9, 2017. Roman brings to the position a deep understanding of issues facing UW-Madison and the greater Madison community, and the need for strong police-community relations, Vice Chancellor for Finance and Administration Laurent Heller said in announcing the appointment. Roman said she looks forward to working with her colleagues in the UW Police Department and with partners across the UW-Madison campus. “Our focus will be on maintaining and enhancing a safe learning, living and working environment while also contributing to student success,” she said. The UW-Madison chief of police leads the UW-Madison Police Department and supports the university’s mission as it works to provide a safe and secure campus. The department has 121 employees, including 61 sworn law enforcement officers. The chief directs all departmental functions and operations and works closely with UW-Madison administration, faculty, staff and students to address problems and strengthen the campus community. Heller thanked interim Chief of Police Brian Bridges for providing strong leadership while serving in the interim role. Roman will succeed Susan Riseling, who served as chief for the past 25 years. Riseling retired in August. Bridges will continue to serve as interim chief until Roman begins her duties. 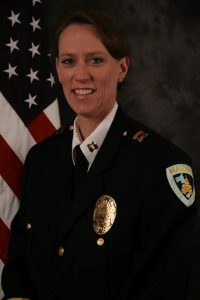 During Roman’s 26-year career with the City of Madison Police Department, she has led and directed a variety of successful programs and initiatives. She was appointed as the first captain to oversee the Community Outreach Section within the department. As captain of community outreach, she proposed, developed and implemented a plan to establish a dedicated team of officers to address mental health-related incidents, divert people with mental illness from the criminal justice system and connect them to necessary treatment. In her previous position as patrol lieutenant, she oversaw field operations for the downtown/isthmus district, working closely with UW-Madison students, administrators, and police. Roman has a master’s degree from Boston University and a bachelor’s degree from UW-Madison. While a student at UW-Madison, she was a member of the UW volleyball team. A 13-member search committee of faculty, staff, students and community members recommended finalists for the chief of police position to Heller. Vice Chancellor for Legal Affairs Ray Taffora chaired the committee.